It’s a new school year, and today is Wednesday…..so it’s time for a new WRITING WEDNESDAY! Today, we’re going to look at a Seymour Simon book that is an old favorite. It’s called PROFESSOR IQ EXPLORES THE SENSES. As you read the pages below, about our sense of sight, think about all the different ways that Seymour Simon and illustrator Dennis Kendrick provide information to the reader. Now that you’ve read these pages, think about the organization of this text. How does it support your learning? For example, are their captions, diagrams or illustrations that help your understanding? Does the design of the pages make a difference? How this book is different from other informational text you have read? If you need to, go back and read again, and then write several sentences about which features of this particular informational text you think are most helpful to understanding more about your sense of sight. When you have finished writing, click on the yellow "Comments" link at the bottom of this blog post to paste in your writing for others to see. As Professor IQ would say, "Every day is a good day to explore!" 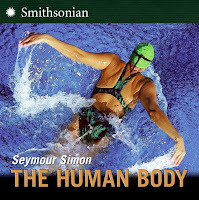 Note for Educators: Seymour Simon’s book is part of the affordable, streaming, narrated eBook collection from StarWalk Kids Media. Click here if you would like to learn more about subscribing to this high quality, affordable collection of Common Core mentor texts. Ever wondered why you can recognize your favorite singer’s voice on the radio? And why is it that a man has a deeper-sounding voice than a woman? Well, we’ll have to explore how exactly our voices work. So, what is a voice? In simple terms, it’s our way of changing the air that we breathe out. We all have something called the voice box (also known as the larynx), which is a small organ in our neck. It houses a set of two folds (the vocal cords) that open and close really fast and vibrate as air passes through them from our lungs to our mouths. The vocal cords’ size, position, and even how they are stretched influences the type of sound that comes out. But that’s not it – the throat, nose, and other parts of our mouths also come into play. Plus, someone’s voice is also affected by how someone chooses to speak – maybe some pronounce their O’s with more of a fish-face! But let’s get back to the question of why men have a lower voice range: simply put, when guys are going through the teen years (yup, those times when you start growing more hair and more muscles), their voice box or larynx also gets bigger. This means the vocal cords grow longer and thicker and this change leads to a deeper voice. Why? Because those thicker vocal cords don’t vibrate as fast. Girls’ voices occasionally get lower, too. When you have a nasty cold, have you ever noticed that your voice gets a bit deeper? This is because your larynx and vocal cords have swollen and the vocal cords vibrate much more slowly. Does the world really need another song about "the heart"? Some body parts are celebrated much more than others in songs. Enough already with the "eyes" don’t you think?! Doesn’t your "spleen" or your "kneecap" deserve a musical tribute? Well, now it’s time to help me create a new collection of songs, poems, raps about less famous, but nevertheless important body parts. Inspired by my new book The Human Body, I’m starting a rather silly contest! Send in a poem, audio clip, video file etc of a short song about an "unsung body part." I’ll post it here, if it tickles my funny bone (hey, there’s an idea for a body part). The Prize: Winners of the best human body part song get an autographed copy of THE HUMAN BODY.